Dr. Dre's lawsuit against the bankrupt Death Row Records successor label WIDEawake Death Row Records has been dealt a blow. 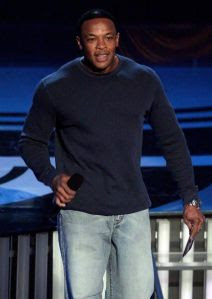 Following WIDEawake's re-release of The Chronic and Dre's greatest hits last year, Dre sued claiming that his trademark and publicity rights had been violated. Dr. Dre also claimed that he has not been paid royalties since he broke from the label and Suge Knight more than a decade ago. Last week, California District Court Judge Christina Snyder dismissed Dre's trademark infringement and publicity rights infringement claims ruling that the re-release did not violate Dre's rights under current trademark infringement law. Judge Snyder did allow the back royalties claim to go forward. Snyder ruled the alterations were 'minor and inconsequential.' She also pointed out that the image used on the cover jacket is the same photograph from the original album, instead of a more current photo, which may have gone further to imply some new endorsement." While Dr. Dre's back royalties claim will go forward, he has lost his trademark infringement claim based primarily on the way he left Death Row in 1996, leaving most of his rights in the catelogue to Suge Knight and Death Row.